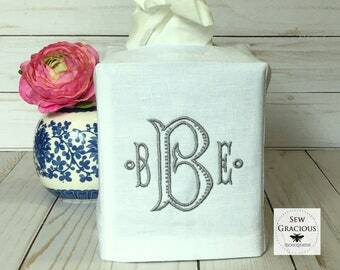 Best-selling Baroque font is gorgeous on tissue box covers! Monogrammed Luggage Tags are the perfect gift for grads, all members of your wedding party and yourself! Never miss your bag at the luggage carousel again! 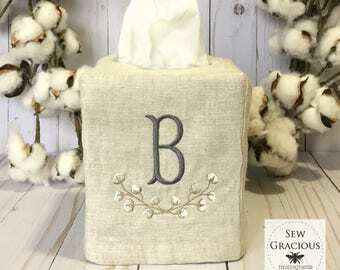 A monogrammed tissue box cover completes any decor! Make a statement with your cocktail napkins by having them monogrammed with a single initial in a bright color! The perfect hostess gift! Order Nov. 19-20 and they will ship Monday Nov. 21 via US Priority Mail! PAGODA FONT! One of the most popular fonts in home decor today. Available on all items in the shop, including these gorgeous hem-stitched linen cocktail napkins. Shop now for holiday parties & hostess gifts. Brand new CROWN Monogram font is perfect for your little prince or princess! Makes a gorgeous wedding gift, too! How pretty is this new shade of thread, called Tiffany? . It's #26 in the Sew Gracious thread chart. Available for any monogram, on any cover! How do you CHILL? Netflix, Wine & Yoga Pants! This and the "coffee" version now available! Original Sew Gracious Design! FLASH SALE for Leap Day! Now til midnight only! Enter coupon code LEAP2016 at checkout for 29% off your order! CHEERS! The holiday season should be Merry & Bright. Cocktail napkins are the perfect way to instantly create a festive mood! Brand new in the Sew Gracious Etsy Shop! Embroidered & monogrammed linens. Quick shipping! Perfect gift for teachers, secret pal, gift exchange and YOU! More towels and cocktail napkins on the way!